I am a big believer in the non-lettuce version of salad when salad is the main course, which is one of the many reasons I love this easy recipe for warm shrimp salad. A salad packed with juicy shrimp and tender asparagus and shavings of parmesan cheese in a warm buttery white wine dressing? I’ll take that over lettuce ANY day of the week. The fact that it only takes about 15 minutes to throw together is purely a bonus. Because when salad season is upon us, you want your warm and wonderful shrimp salad to be ready as soon as possible. Got your shrimp and asparagus ready? Let’s make it! Late spring is officially salad season in my book, and one of the ways I know it is upon us is when my back yard turns into Chipmunk Grand Central Station. I’m sure these critters are responsible for the one million chipmunk sized holes in my garden, but they are so dang cute that I’m willing to overlook the holes. I mean, look at him (her?) just sitting there pretending like he (she?) doesn’t know I am taking his (her?) picture. Nonchalant little devil. 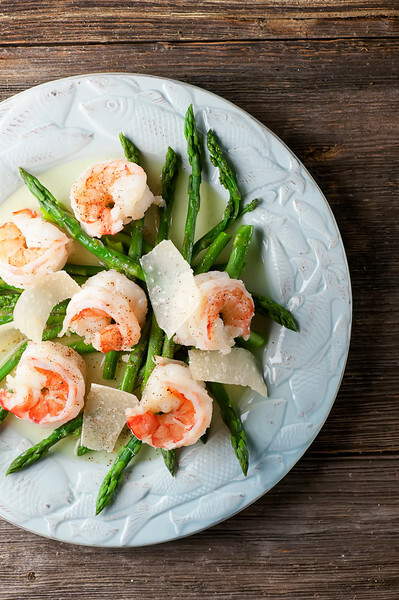 Back at the salad, you want some large shrimp, nicely peeled and butterflied (click here for how to butterfly a shrimp and don’t worry, it is easy peasy) some nice thin asparagus, and a hunk of parmesan cheese. The dressing is going to be a quick mixture of melted butter, white wine and lemon juice, but we will get to that in a sec. Bring a pot of salted water to a boil and quickly cook the asparagus JUST until it is crisp-tender – we are talking 2 minutes or so. Scoop them out and drop in the shrimp with a little Old Bay seasoning, and simmer them up until they are just cooked through, about 3 minutes. Scoop them out too. …and now THAT is what I call a salad! Happy warm and wonderful salad season, all! Bring a large pot of water to a boil and add a generous pinch of salt. Add asparagus and cook until crisp-tender, about 2 minutes. Remove and set aside. Add shrimp and Old Bay to the water and simmer until shrimp are cooked through, about 3 minutes. Drain and set aside. Melt butter in a small saucepan over medium heat. Add wine and lemon juice and simmer for one minute. Assemble as follows: asparagus, topped with shrimp, drizzled with dressing. Scatter parmesan on top and grind on some pepper. Serve at once. Ah, cutest chipmunk ever!! I wouldn’t mind the mischief either :) And I love that you changed up the usual salad routine here and skipped the lettuce. Know I won’t miss it with all this delicious asparagus and shrimp on my plate! Perfect spring dish – pinned! What a great looking salad Kate! I also favor salads sans lettuce! So much heartier! And shrimp is a staple at our house during the summer, so I’ll be putting this one on my list. Perfect for a girls luncheon! Thanks for sharing. Hope you have a great week. It’s totally salad season, and I’m psyched about it! Like you, I’m a fan of the warm salads. And a buttery wine sauce? I’d eat it with a spoon! It’s all of the sudden winter coat season here in NJ (SIGH!) so I am even more excited about warm salads. Come on, SUMMER! Salad season is all year for me, but I especially love it when the weather gets warmer. This shrimp salad looks perfect! 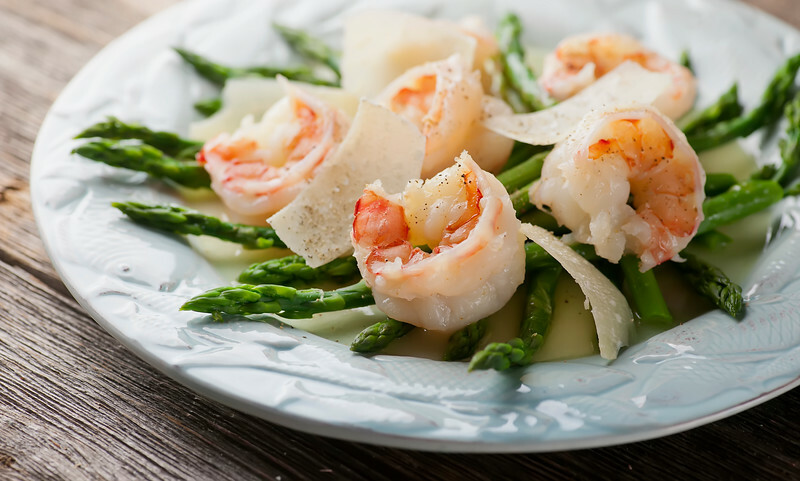 Asparagus and shrimp are two of favorite things. Who am I kidding? Everything is my favorite! I love a good salad and this one is absolutely perfect. Love this simple and fresh recipe! It would make a perfect healthy light dinner and that furry, little chipmunk are so difficult to capture, beautiful picture. 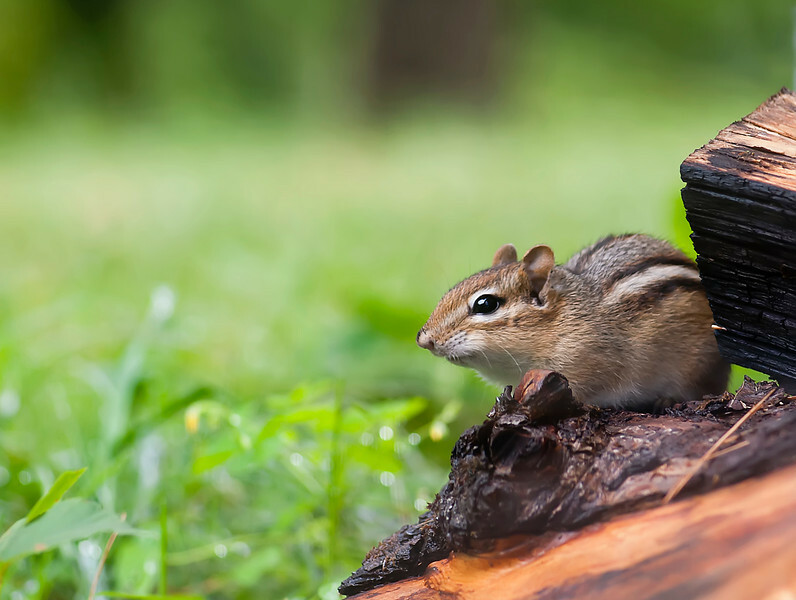 Aww, what an adorable chipmunk. What a great looking salad Kate! So light and delicious. Have a great week.